NOON & Co. is a concept I developed for an online retail store back in 2015. 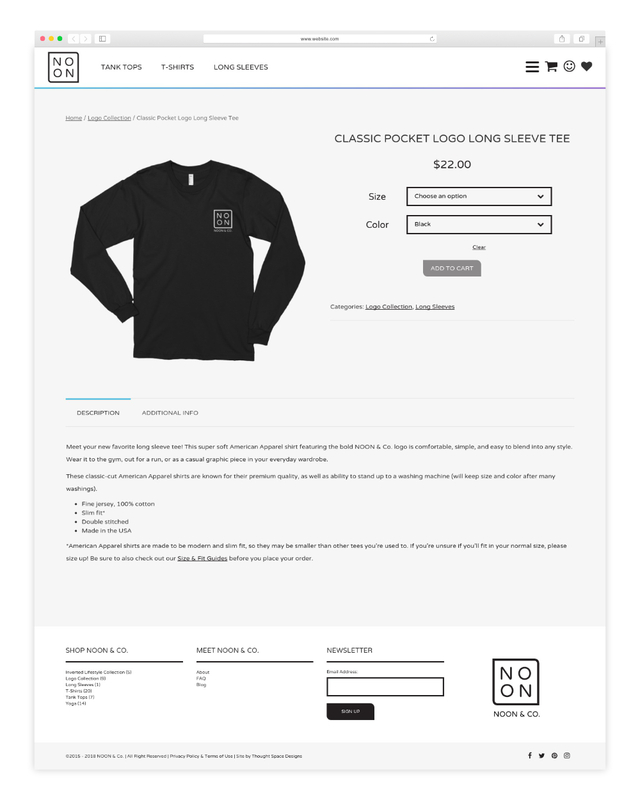 I wanted to gain experience with designing and building eCommerce sites using WooCommerce, so I came up with the idea for NOON as an experiment. NOON & Co. is a brand focused on athleisure style clothing for individuals who like the comfort of athletic clothing. I started the company with the intension of selling graphic t-shirts in order to fund developing an actual clothing line in the future. The logo, brand identity, and website are all custom designed and coded. The idea behind NOON was created entirely from nothing. I knew I wanted to create an online store to work with eCommerce, however I did not know what I wanted to sell. I got the idea of selling clothing because online clothing stores are a huge industry, and I also have a strong interest in fashion and visual merchandising from working in retail myself. I chose to focus on casual and athletic clothing because a lot of my own hobbies revolve around physical activity. With an industry idea in mind, I moved on to coming up with a brand name. NOON & Co. was chosen to represent the concept of “midday” – which is when most people are awake, active, and going about their lives. 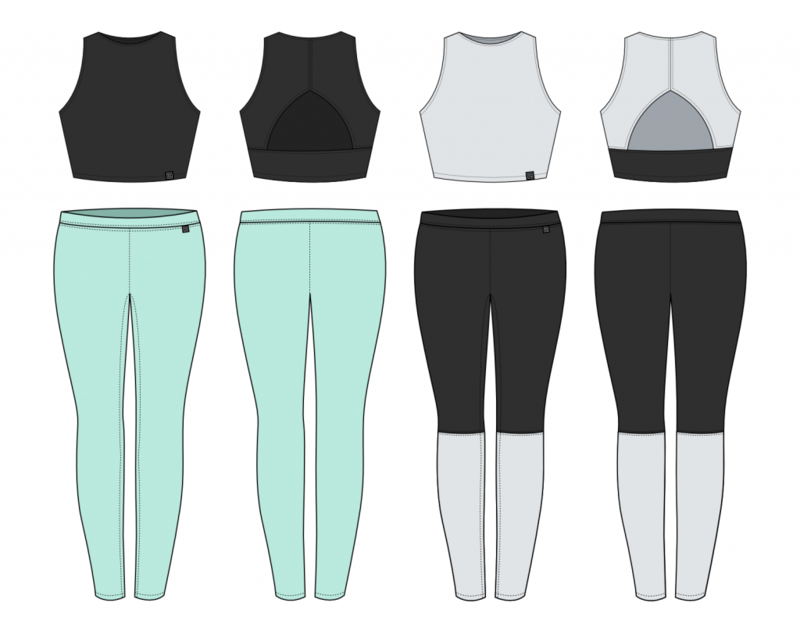 NOON’s product line would focus on practical yet stylish casual pieces that appeal to physically active adults. The “& Co.” in the name would allow for expansion of the product base through wholesale programs for brands that fit the NOON & Co. business model. Finally I tackled the brand identity for the company. The logo and brand had to be bold, modern, and fit in with other athleisure brands that it could compete with in the future. The logo plays off the symmetry of the word “NOON” and uses a simple outline shape as a border. The site needed to appeal to demographics that purchase from similar brands like American Apparel and Lululemon. Competitor websites utilized vibrant photography alongside a minimalistic brand to put their products in the spotlight. I applied this concept to the NOON & Co. site with modern photography and clean design elements. Armed with a new brand identity and demographic, I set out to build an entirely custom WordPress website powered by WooCommerce. I approached the site design the same way I would approach a visual merchandising job at a brick & mortar retail store. Every section had to be well organized to keep shoppers looking around and moving towards the checkout. With the use of bold icons, clear language, and clean site layout, I was able to create a minimalistic online shopping experience where the products are center stage. The site is centered around product categories that appeal to athletic customers. Shoppers can choose to shop by style (t-shirts, long sleeves, etc. ), or choose a category based on their favorite activity (yoga, running, etc.). The individual product pages needed to be simple and easy to use as well. I stripped a lot of the excess layout elements for the product pages so that just the product image and options were front and center. With a clear product photo and the most important product info above the fold, shoppers can easily add the item to their cart without needing to search the page for what they want. In order to fill the NOON & Co. shop, I needed to come up with a series of products. 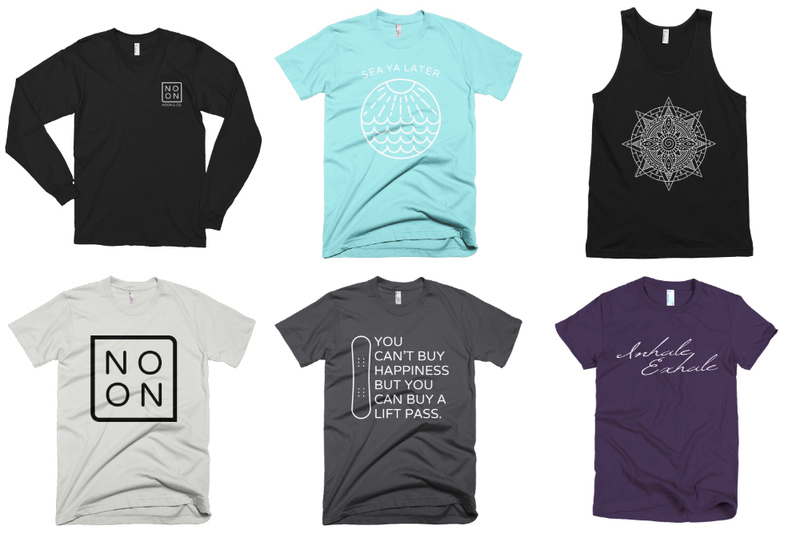 I designed a series of t-shirts for the site that range from simple logo tees, to artistic graphic designs that appeal to athletic customers. 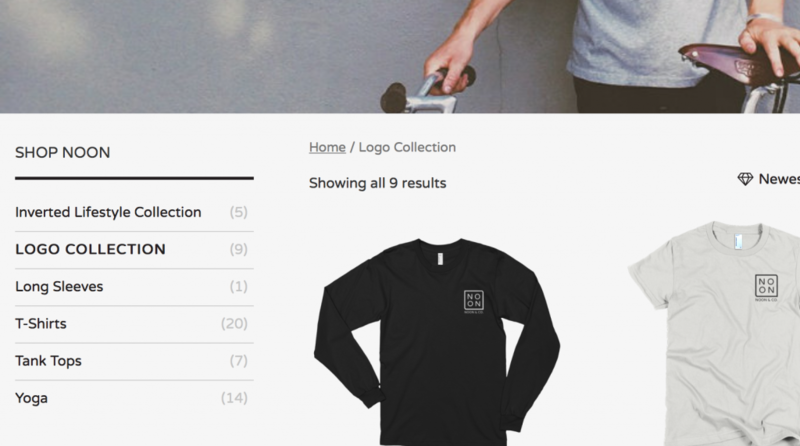 All of the shirts reflect the minimalistic look and feel of the site by only utilizing only black or white graphics on a variety of different colored shirts. 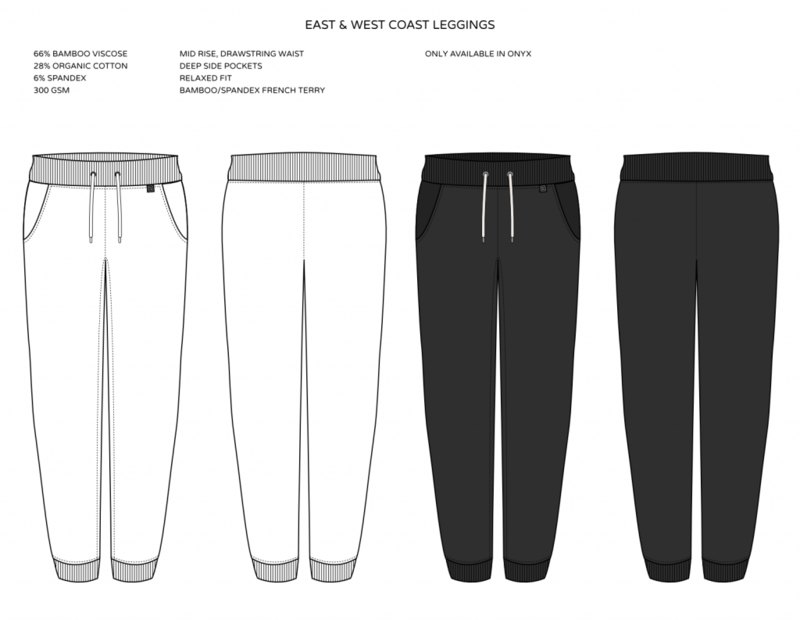 I also developed a collection of activewear that would have been an original clothing line through NOON & Co. With a background in sewing and textiles, I was able to create a series of technical drawings for the products, although they were never launched on the site. Again, these designs stuck with the simple, practical design of the rest of the brand and would be sold as wardrobe staples that coordinate with many other clothing styles.